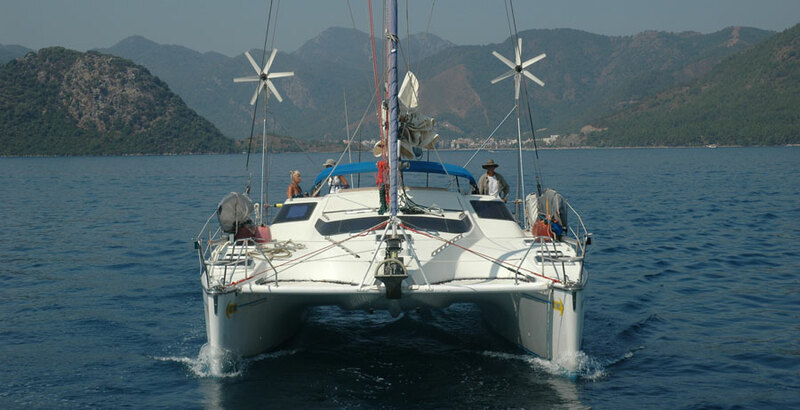 SAILING DVD THAT SHOWS WHAT IT'S LIKE TO CRUISE ON A CATAMARAN. CAPTAIN DAVE. It’s all too easy to focus on the storms of life and worship at the altar of fear. It’s easy to forget that storms come and go, but dreams can last forever. In more than thirty-three thousand miles of offshore sailing, we have had winds to fifty knots on only three occasions. That makes about six days of gale force winds during an eleven year sailing voyage around the world. 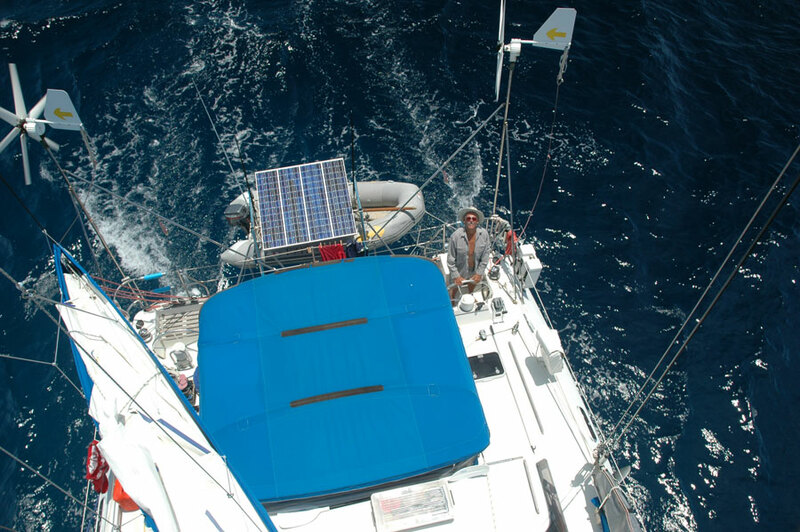 I think that our experience is fairly typical for people who do trade wind circumnavigations. If you stay out of the higher latitudes and don’t sail in hurricane season, it’s unlikely you will ever encounter a storm that poses a significant threat to your yacht. That’s the real world of sailing. The fear mongers would have us live in a very different world. This year, they predicted that hurricane season would be one of the worst on record. There would be more storms and storms of greater severity than at any time in recent history. Fear makes you tune in to the Weather Channel so that you can listen to their forecasts of doom and gloom. The Apostles of Fear would have you believe that we live in a dangerous world, because fear is big business. Capitalism has embraced fear and wants you to buy their particular antidote to fear. I am not buying what they are selling. 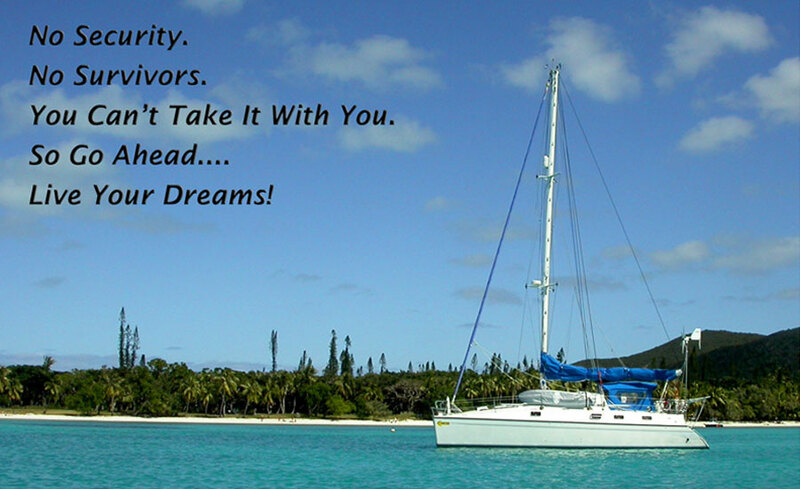 Whether I am on land or sea, I am not afraid, but I am tired of listening to the fear mongers. I wish they would go away or go silent. They are boring me with their negative and toxic palaver. I listened to the fear mongers tell me how dangerous it was to live in the Middle East, and contrary to their prophecies of doom, I lived in Saudi Arabia for sixteen years without a problem. I listened to the fear mongers tell me about the perfect storm and how dangerous it was to sail the seven seas, and contrary to their predictions, in eleven years, I never sailed in winds over fifty knots. I listened to the fear mongers tell me that catamarans were dangerous to sail offshore, and I sailed one around the world without a problem. I have figured out that when people tell me that I should be afraid, they either don’t know what they are talking about, they are trying to control me with fear, or they want to sell me something as an antidote to the fearful world that they are trying to cultivate in my mind. I’ve got my mental ear plugs in, and I’m no longer listening to their gospel of fear. I won’t let them control the focus of my mind or steal my dreams. Instead, I’m focusing on my dreams. I’m projecting my dreams onto the motion picture screen of my mind so they can expand into my life. I know that life is good. I live in the Land of Possibility, and I sail on the ocean of my dreams where there is no limit to how good my life can become. I have been tested in the crucible of life, and I know the truth. There is nothing to fear, and focusing on the storms of life is a waste of precious time. Storms come and go, and they are few and far between. Dreams are different. They go on forever. That’s why I focus on my dreams. That’s why I live as if my dreams are possible and work each day to make them happen. That’s why I’m an Unstoppable, Consistently Positive, Endlessly Persistent, Doer of Dreams. Click on this button to tell your friends about Go Ahead, Live Your Dreams. There is a certain amount of comfort derived from planning your future. A man with a plan usually goes the distance, and a man without a plan goes nowhere. There's no doubt about it, you need a plan. But a plan is much different than a scheduled itinerary. A plan is a general direction with possible stops along the way and suitable contingencies should problems arise. Plans are great as long as you don't fall in love with them, and then get stressed out when things don't work out exactly as hoped. The plan is there to get you going - it helps you overcome the inertia caused by fear, indecision, and ambivalence. The plan also tells you where to take the next step. That's how you make dreams come true; you take a series of steps, and each step is in the right direction. When you live your dreams, you don't need to see far into the distance. 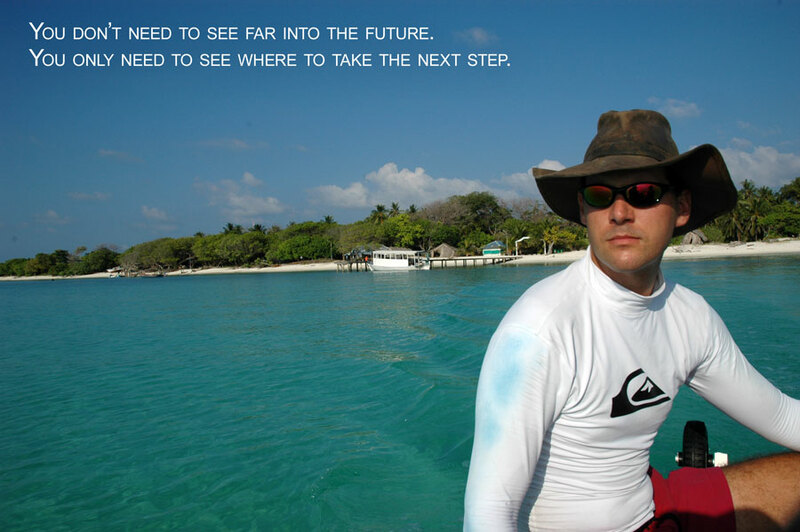 You only need to see where to take the next step. The same is true when you sail across an ocean. While we were sitting in Gibraltar preparing to cross the Atlantic, we knew we had to take three giant steps. The first was eight hundred miles southwest to the Canary Islands. The second was seven-hundred and fifty miles southwest to the Cape Verde Islands. The third was two-thousand one hundred miles west to Barbados in the Caribbean. Each of these steps consisted of smaller ones that we took each day in the right direction - one day at a time, one step at a time. The giant step from the Cape Verdes to Barbados required more than two weeks because there were no trade winds during the first half of the trip. It was mostly motoring or slow sailing in light northeasterly breezes. We had a plan, and worked our plan. We carried twelve jerry cans of fuel because we knew this was a windless year in the eastern Atlantic. There was a high probability we would need a large amount of fuel to make it to longitude forty degrees west where reliable trade winds made their appearance. That meant we needed to carry enough fuel to motor one-thousand windless miles. People who didn't have enough fuel drifted west under spinnaker and light air sails making sixty miles a day toward their destination. One boat was at sea for nineteen days and still had one-thousand three hundred and fifty miles to go before arriving in the Caribbean. If sailors could see into the future, they could always leave port with favorable winds that would continue all the way to their next port. Sailing would be a waiting game in which they sailed only when conditions were perfect. That's exactly what many sailors attempt to do; they take a trip to fantasyland downloading weather files that purport to predict wind direction and speed one week in advance. Actually these files should be called computer generated wind fantasies because the predicted winds frequently don't materialize. It would be great if long range weather predictions were accurate. Then crossing an ocean would be like catching a train on schedule and riding it to your destination. But that's not the way you sail across oceans. Weather predictions are generally accurate one or two days in advance, but beyond that they are a trip to fantasy land. They make excellent fodder for feeding endless speculation regarding what your weather might be on passage. But highs and lows, fronts and troughs, and tropical waves and hurricanes are all chaotic in their behavior, and therefore, unpredictable. Mariners must accept the chaotic nature of weather and set off with a sea chest full of contingencies - ready to deal with the meteorological mysteries that unfold along the way. After all, they are a sailboat, and sail they must. Port tacks, starboard tacks, beating, reaching, and running are all in their bag of sailing tricks. And if they use their common sense, they will arrive at their destination earlier or later than planned, but they will arrive, and it will be an adventure. And that is why they sail. Adventure. Arriving is a great reward giving a sense of accomplishment. But the voyage is even more important, because in the voyage lies the adventure. When they are finally in safe harbor, the biggest part of the adventure is over. They will enjoy their time in port, checking out the sights and renewing acquaintances with fellow cruisers for a week or two. There will be plenty of time to discuss their adventures with their friends until they pull up their anchors, raise their sails, and a new adventure begins. TAKE THE PLUNGE AND ORDER THE RED SEA CHRONICLES. DIVE INTO A GREAT CRUISING DVD. YOU WILL BE GLAD THAT YOU DID! 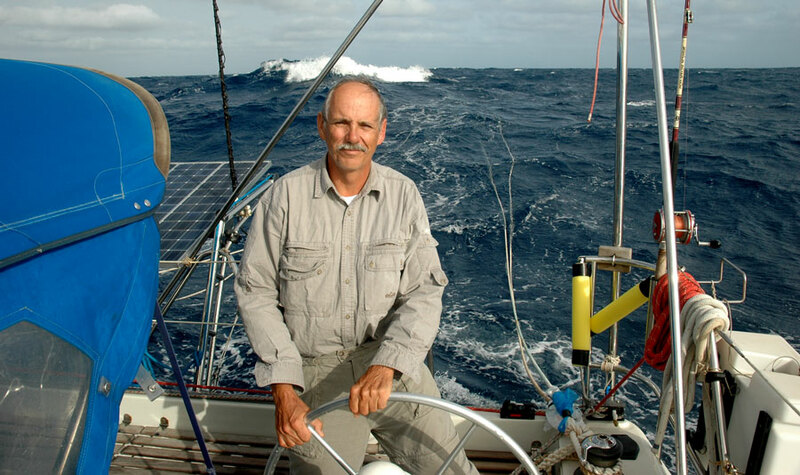 Captain Dave always dreamed of sailing around the world on his own sailboat, and his eleven year circumnavigation with his family made his dream come true. Donna earned her stripes the REALLY old fashioned way...by enduring the rigors of passage making for the thrill of exploring exotic ports across the globe. Sarah is the newest member of the family and crew. Despite her limited sailing experience, she jumped right in to life on the high seas. 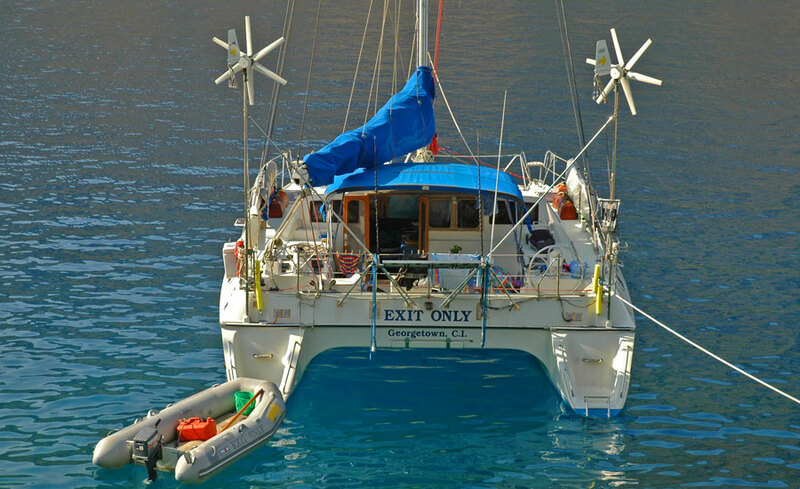 Her fresh and enthusiastic perspective on cruising help make the Red Sea Chronicles so special. David shot over 170 hours of footage on the voyage from Australia to Florida. He then spent a year and a half on dry land editing and producing the Red Sea Chronicles DVD. In addition to the narrating the film, David also scored, performed, and recorded the entire soundtrack for the project. 10. The Red Sea Chronicles is an affordable CHRISTMAS gift for the sailor in my life. Where else can I get a totally awesome gift for only twenty bucks? 9. I work hard for a living, and I deserve to reward myself with the Red Sea Chronicles. 8. My Dream Machine could use a shot in the arm, and the Red Sea Chronicles will give it the boost that it needs. 7. Every minute spent watching The Red Sea Chronicles extends my life by a full year. 6. I want to see what it's like to cruise on a catamaran before I spend a bazillion dollars purchasing one. 5. I want to see how a catamaran handles in heavy weather. 4. I want to see the Storm Management video so I understand what I need to do when I get in a storm at sea. 3. 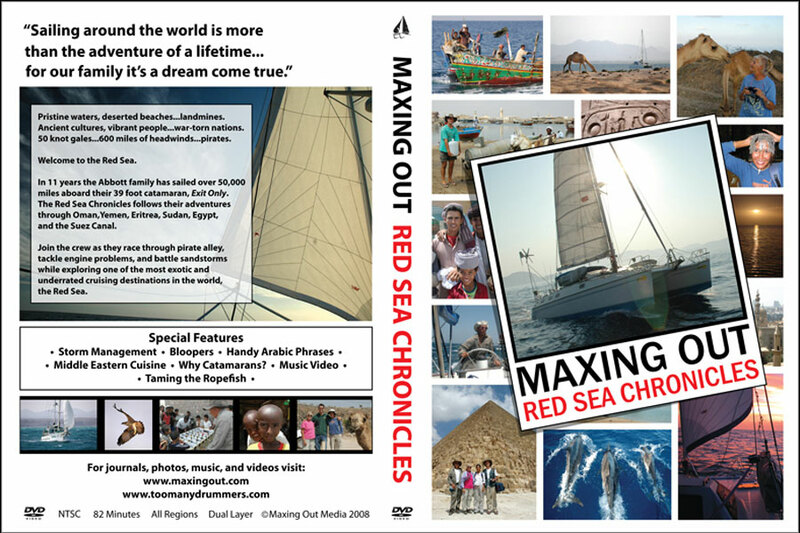 If I buy The Red Sea Chronicles, then Maxing Out Media will start production on two new DVD's - Australia to the Red Sea, and Med Sea to the Caribbean. 2. I like the Maxing Out web site, and I would like to support the website by purchasing their DVD. 1. After watching the Red Sea Chronicles, I can finally see myself sailing on the ocean of my dreams. "Story, quality, music, people, boat... Just excellent." "...we got the DVD yesterday and watched it last night (we had no problem with the different format at all), what a great adventure and well put together DVD it was entertaining as well as informative and funny at times, a great combination. Well done you guys are natural movie stars, Laura and I watched the DVD twice and I am sure we will watch it many more times in the future." "I hope you guys are going to make more DVD’s of your previous sailing trips for us to enjoy." "Amazing...Just watched your dvd The Red Sea Chronicles for the third time today...I called my boss at home and turned in my notice...I'm going sailing!" "The best cruising video to date from any source and should be on the shelf of every one who shares the cruising spirit even if only in dreams." "...a great video that transported me from a damp, cold day in Wales to cruising aboard Maxing Out in the Red Sea - pure nectar." "The only "problem" is that this has left me wanting more of the same stuff, just from some of the other places Maxing Out has visited!" "Thumbs up. I also wish the entire circumnavigation was documented, but this small portion in the Red Sea is excellent. Well done." "I just watched the Red Sea Chronicles and second what all the others have said. I'd love to see a whole series of Maxing Out DVDs...Good job!" The Red Sea Chronicles is now available! We are attacked by flying fish as we cross the Indian Ocean on our way to Salalah, Oman. When we make landfall, the local suq (market) helps us regain our land legs. We arrive in Aden with a damaged alternator and are delighted to find a superb local machine shop. As we prepare to leave, fellow cruisers are attacked by pirates. 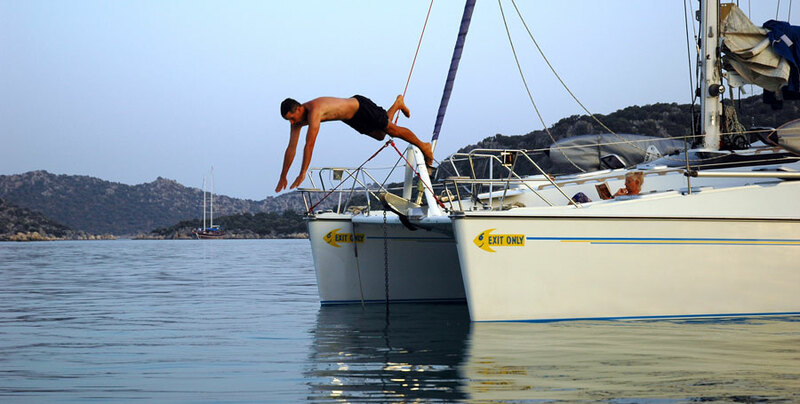 How Big Should Your Anchor Be? Go Ahead. Live Your Dreams.